Oman Sail’s GC32 Sultanate of Oman, supported by the Ministry of Tourism of Oman and EFG Bank Monaco, took centre stage on Lake Traunsee in Austria today with another show of awe-inspiring teamwork that puts them at the top of the leaderboard halfway through the inaugural Bullitt GC32 Racing Tour. The wind once again was light and fickle which called for expert judgement and communication among the teams but it was Leigh McMillan and his scratch crew on Sultanate of Oman, who judged best, to finish on the podium in each of the five races completed, adding two further outright wins to their tally from day one. This strong performance gave them a six point lead over second placed Alinghi and according to America’s Cup sailor Alister Richardson, who is a foiling expert after racing AC45s for Italian team Luna Rossa, the success can be put down quite simply to teamwork. “We all know each other really well and although this is the first time we are racing together as a group, we work really well as a team,” he said. “If you know each other well, you don’t have to talk as much – especially where Pete Greenhalgh and I are concerned. I kind of know what he is thinking. “Obviously we are not happy all the time with our manoeuvres but we are not getting frustrated, just trying to stay nice and relaxed while always learning and trying to improve. “The secret today was to stay calm and not chase what other boats were doing. Our aim was to keep our heads out of the boat and sail towards wind we could see, rather than chase wind that had been. Oman’s Nasser Al Mashari, the Sultanate of Oman’s bowman is an Extreme 40 expert but has spent just a few days on the GC32 and has high expectations of what might be achieved, given a little more time on the boat. “Our second day was even better than the first but we still need practice on this boat because it is still new to us,” he said. Oman Sail CEO David Graham is visiting the team in Lake Traunsee and went ‘flying’ for the first time this afternoon onboard Sultanate of Oman – he admitted to being blown away by the boat, the class and the GC32 team. “It was an incredible experience. The Sultanate of Oman team was amazing – with a lot of experience and expertise from different campaigns but all fitting and working well together,” he said. 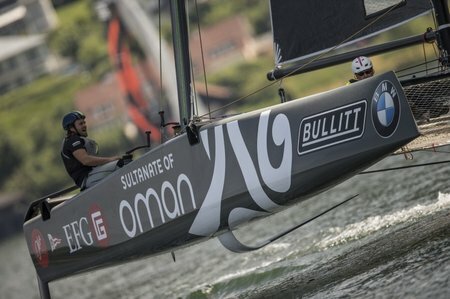 Oman Sail’s decision to race the new Bullitt GC32 Racing Tour was looking like a good one, he added, on a number of counts. “We have always aimed to be at the cutting edge of the sport and we are doing that over time. Look at what we are doing on the MOD70 with the speed records and then the Extreme 40s with The Wave, Muscat and Oman Air. “The GC32 opportunity came up and it seemed like the logical thing to do. It is very impressive what the class has done in a short space of time and the venues linked in with the Ministry of Tourism’s key markets so it was almost tailor made.